The TV90 is designed for ease-of-use. You'll spend less time operating the TDR and more time repairing faults. Simply select the cable type to be tested and the TV90 does the rest. Impedance, VP,gain, pulse width and vertical position are automatically selected and adjusted as you scan the cable. Just move the cursor to the fault to pinpoint its location. On the performance side, the TV90 employs optimised pulsing and sampling coupled with advanced filtering and signal processing techniques to ensure the maximum measurement rante. That way, you'll always have a clean waveform for easier fault interpretation. The TV90 provides a 5 ns pulse width for close-in resolution. Faults as near as 3 ft. from the pedestal can be located with ease. 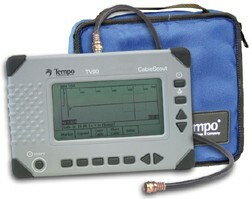 Best of all, you get all this performance in a rugged handheld TDR package.